Once I know I won’t need a file again, it’s gone. (Regular back-ups with Time Machine have saved me from my own excessive zeal at least once.) Similar economy applies to runtime: My primary computing device is my laptop, and I’m often too lazy to fire up a cloud instance unless the job would take more than a day. read it into memory quickly in R and/or Python. binary helps with part of (2) but has the downside of being a binary file that I might not be able to open at some indeterminate point in the future–violating (1). And a memory-hogging CSV that also loads slowly is the worst option of all. or the compression option for read_csv in pandas). It’s definitely smaller–the 1979 GDELT historical backfile compresses from 115.3MB to 14.3MB (an eighth of its former size). Reading directly into R from a .gz file has been available since at least version 2.10. Reading the gzipped file takes less than half as long as the unzipped version. It’s still nowhere near as fast as loading the rda binary, but I don’t have to worry about file readability for many years to come given the popularity of *nix operating systems. Consider using .gz files for easy memory management and quick loading in R and Python. In a recent conversation on Twitter, Christopher Zorn said that Stata is fascism, R is anarchism, and SAS is masochism. While only one of these is plausibly a programming language, it’s an interesting political analogy. We’ve discussed the politics of the Ruby language before. This spring Josh Cutler‘s Python course was back by popular demand. (This time it was known as “Computational Political Economy” but I like the less formal title.) I participated this time around as a teaching assistant rather than student, and it was a thoroughly enjoyable experience. The course syllabus and schedule is on Github. Class participants were expected to have a basic familiarity with Python from going through Zed Shaw’s book over Christmas break outside of class. Each Tuesday Josh would walk them through a new computer science concept and explain how it could be used for social science research. These topics included databases, networks, web scraping, and linear programming. On Thursdays they would come to a lab session and work together in small groups to solve problems or answer questions based on some starter code that I supplied. I generally tried to make the examples relevant and fun but you would have to ask them whether I succeeded. The class ended this past Saturday with final presentations, which were all great. The first project scraped data from the UN Millenium Development Goal reports and World Bank statistics to compare measures of maternal mortality in five African countries and show how they differed–within the same country! This reminded me of Morten Jerven’s book Poor Numbers on the inaccuracy of African development statistics (interview here). In Scrabble, there is a finite amount of resources (letter tiles) that players use to create value (points) for themselves. Similarly, in the real world matter cannot be created so much of human effort is rearranging the particles that exist into more optimal combinations. The way that we keep track of how desirable those new combinations are in the economy is with money. Fiat currency has no intrinsic value–it is just said to be worth a certain amount. Sometimes this value changes in response to other currencies. Other times, governments try to hold it fixed. The “law of Scrabble” has remained unchanged since 1938 when it was introduced–but that may be about to change. What has changed in the intervening years is the set of acceptable words, the corpus, for competitive play. As an enthusiastic amateur player I’ve annoyed several relatives with words like QI and ZA, and I think the annoyance is justified: the values for Scrabble tiles were set when such words weren’t acceptable, and they make challenging letters much easier to play. For Scrabble, Valett provides three advantages over Butts’ original methodology. First, it bases letter frequency on the exact frequency in the corpus, rather than on an estimate. 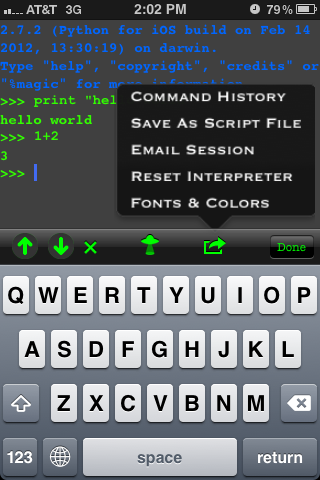 Second, it allows one to selectively weight frequency based on word length. This is desirable because in a game like Scrabble, the presence of a letter in two- or three-letter words is valuable for playability (one can more easily play alongside tiles on the board), and the presence of a letter in seven- or eight-letter words is valuable for bingos. Finally, by calculating the transition probabilities into and out of letters it quantifies the likelihood of a letter fitting well with other tiles in a rack. So, for example, the probability distribution out of Q is steeply peaked at U, and thus the entropy of Q’s outgoing distribution is quite low. The answer is: yes indeed, I (Norvig) am interested! And it will be a lot easier for me than it was for Mayzner. Working 60s-style, Mayzner had to gather his collection of text sources, then go through them and select individual words, punch them on Hollerith cards, and use a card-sorting machine. 1. I consulted the Google books Ngrams raw data set, which gives word counts of the number of times each word is mentioned (broken down by year of publication) in the books that have been scanned by Google. 2. I downloaded the English Version 20120701 “1-grams” (that is, word counts) from that data set given as the files “a” to “z” (that is, http://storage.googleapis.com/books/ngrams/books/googlebooks-eng-all-1gram-20120701-a.gz to http://storage.googleapis.com/books/ngrams/books/googlebooks-eng-all-1gram-20120701-z.gz). I unzipped each file; the result is 23 GB of text (so don’t try to download them on your phone). 4. I generated tables of counts, first for words, then for letters and letter sequences, keyed off of the positions and word lengths. While ETAOINSR are all, appropriately, 1-point letters, the rest of Norvig’s list doesn’t align with Scrabble’s point values…. 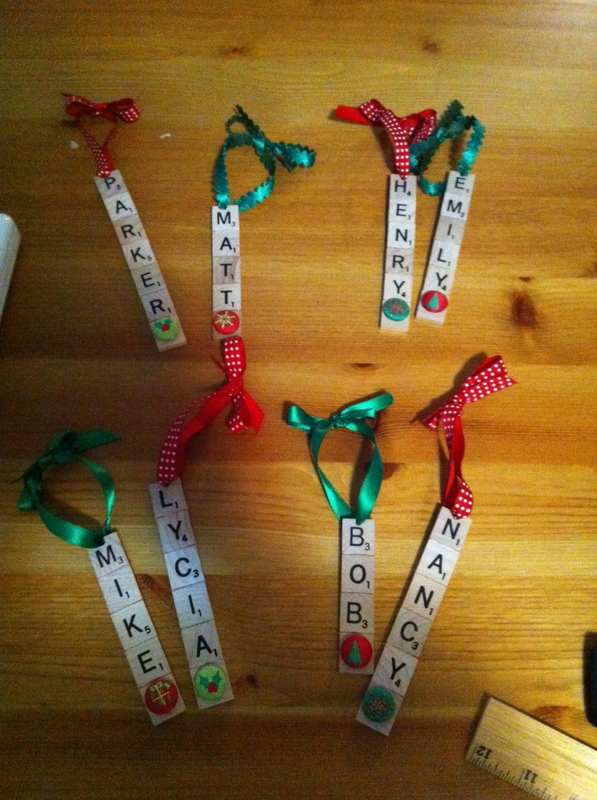 This potentially opens a whole new system of weighing the value of your letters…. H, which appeared as 5.1 percent of the letters used in Norvig’s survey, is worth 4 points in Scrabble, quadruple what the game assigns to the R (6.3 percent) and the L (4.1 percent) even though they’re all used with similar frequency. And U, which is worth a single point, was 2.7 percent of the uses—about one-fifth of E, at 12.5 percent, but worth the same score. This confirms what every Scrabble player intuitively knows: unless you need it to unload a Q, your U is a bore and a dullard and should be shunned. Eifling points out that Q and J seem quite undervalued in the present scoring system. So what is an entrepreneurial player to do? “Get rid of your J and your Q as quickly as possible, because they’re just damn hard to play and will clog your rack. The Q, in fact, is the worst offender,” he says. Who knew that the much beloved board game could provoke such strong feelings? With a fifth edition of the Scrabble dictionary due in 2014 it seems possible but highly unlikely that there could be a response to these new findings. A more probable outcome is that we begin to see “black market” Scrabble valuations that incorporate the new data, much like underground economies emerge in states with strict official control over the value of their money. Yet again, evidence for politics in everyday life. 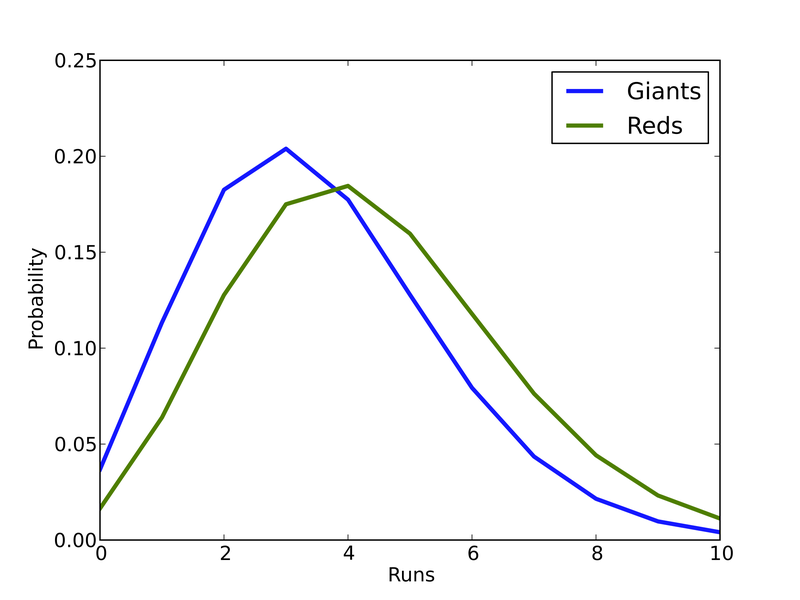 Simulating the NLDS: Can the Giants Win? In Allen Downey’s new book, Think Bayes, he relates the “Boston Bruins” problem. The problem is to estimate the Bruins’ probability of winning the 2010-2011 NHL championship after two wins and two losses. I will briefly describe Downey’s approach, and then relate it to the current situation of the San Francisco Giants. One (naive) approach would be to model this as a gambler’s ruin problem. There are two problems with that model for this problem: the total number of rounds to be played is uncertain (i.e. the championship is a best of n rather than play until one side is totally defeated), and it throws away important information about the score of the games. Instead, we model baseball as a Poisson process, in which it is equally likely for a run to be scored at any time during the game. This is still somewhat of an oversimplification (the odds are better when you have runners on base, for example), but we are getting closer to the “true” model. 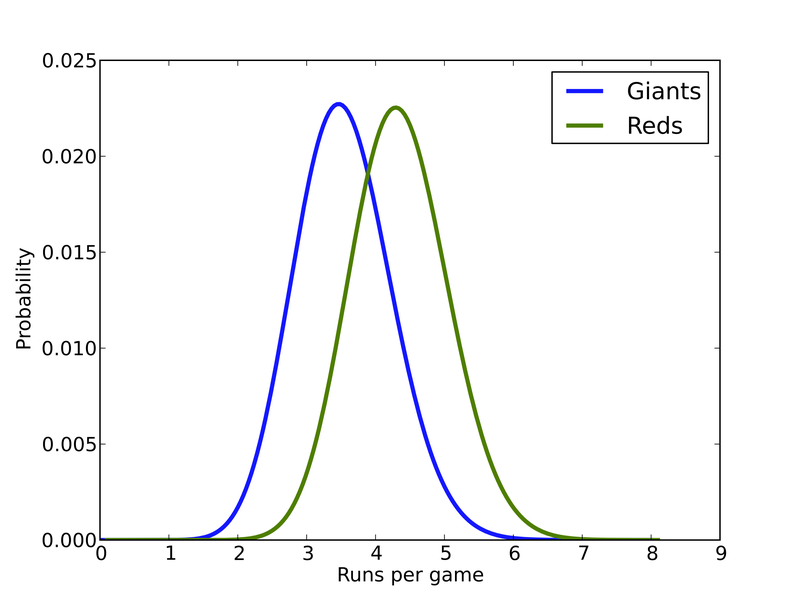 Second, we assume that games between the Reds and Giants in this year’s National League Division Series are similar enough that they can be considered as outcomes from Poisson distributions in which each team’s scoring distribution is consistent between games with parameter λ. Different pitchers could cause this assumption to be thrown off (no pun intended), but we will again use it as a not-entirely-implausible simplification. 1. Use statistics from previous games to choose a prior distribution for λ. 2. Use the score from the first four games to estimate λ for each team. 3. Use the posterior distributions of λ to compute distribution of goals for each team, the distribution of the goal differential, and the probability that each team wins. 4. Simulate the rest of the series to estimate the probability of each possible outcome. To calculate λ, we will use the team batting stats from ESPN and the thinkbayes Python package from Downey’s site. According to the model’s predictions, the probability that the Giants win today’s game (and the division series) is 0.387. I would have preferred to use a Gamma prior for λ and run some more simulations in R, but I wanted to use Downey’s example and get this up before the game started… which was a few minutes ago (although as I post, the score is still 0-0). Either way, enjoy the game! From historians to financial analysts, researchers of all stripes are interested in prediction. Prediction asks the question, “given what I know so far, what do I expect will come next?” In the current political season, presidential election forecasts abound. This dates back to the work of Ray Fair, whose book is ridiculously cheap on Amazon. In today’s post, I will give an example of a much more basic–and hopefully, relatable–question: given the height of a father, how do we predict the height of his son? 1. How different is the predictor from its baseline? It’s not enough to just have a single bit of information from which to predict–we need to know something about the baseline of the information we are interested in (often the average value) and how different the predictor we are using is. The “Predictor” in this case will refer to the height of the father, which we will call . The “outcome” in this case will be the height of the son, which we will call . where is the mean and is the standard deviation. In our example, let , , and . 2. How much variance in the outcome does the predictor explain? is explained in the next paragraph. 3. What margin of error will we accept? No matter what we are predicting, we have to accept that our estimates are imperfect. We hope that on average we are correct, but that just means that all of our over- and under-estimates cancel out. In the above equation, represents our errors. For our prediction to be unbiased there has to be zero correlation between and . You might think that is unrealistic and you are probably right, even for our simple example. In fact, you can build a decent good career by pestering other researchers with this question every chance you get. But just go with me for now. The level of incorrect prediction that we are able to accept affects the “confidence interval.” We will ignore confidence intervals in this post, focusing instead on point estimates but recognizing that our predictions are unlikely to be exactly correct. which is the expected son’s height given a father with a height of 72”. which reduces to . As long as we were correct earlier about not depending on and having an average of zero, then we get a predicted son’s height of 71.5 inches, or slightly shorter than his dad, but still above average. This phenomenon of the outcome (son’s height) being closer to the average than the predictor (father’s height) is known as regression to the mean and it is the source of the term “regression” that is used widely today in statistical analysis. This dates back to one of the earliest large-scale statistical studies by Sir Francis Galton in 1886, entitled, “Regression towards Mediocrity in Hereditary Stature,” (pdf) which fits perfectly with today’s example. Further reading: If you are already comfortable with the basics of prediction, and know a bit of Ruby or Python, check out Prior Knowledge. 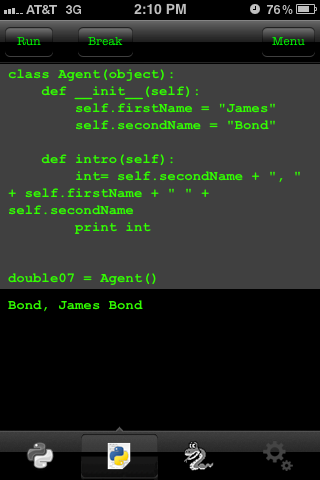 Over the weekend I implemented a version of the agent-based model from Thomas Schelling’s 1971 paper in Python. Schelling’s story about segregation is simple: there are two colors of agents, happiness is based on whether two or more of your neighbors are the same color as you, and you move if you are unhappy. You might not be surprised to hear that this model leads to some segregation, but you might be surprised by the degree. Fairly quickly, clusters of similar agents appear. The clusters grow and coalesce over time until there are a small number of large clusters and most agents live in homogeneous neighborhoods. If you did not know the process and only saw the result, you might assume that the agents were racist, but in fact all of them would be perfectly happy in a mixed neighborhood. Since they prefer not to be greatly outnumbered, they might be considered xenophobic at worst. Of course, these agents are a wild simplification of real people, so it may not be appropriate to apply these descriptions at all. 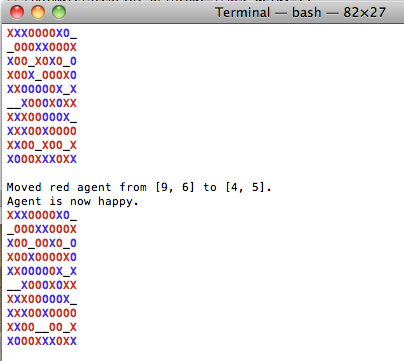 Unhappy agents are represented by X’s, happy ones by O’s. The only substantial departure from the exercise here is that I base happiness on four neighbors (up, down, left, right), rather than eight (including the diagonals) because I misread the instructions the first time. This departure makes the agents less tolerant than in Schelling’s original. The neighborhood shown above is 10×10, but the code should be generalizable. Ninety percent of the houses are filled, which leaves some empty ones for moving around. My code is here, including some comments indicating planned improvements. For the pointer to Downey’s book, I thank Josh Cutler.